For “Beatriz at Dinner,” Salma Hayek has been transformed from an international glamour queen to one more brown woman in the American service economy. Clad in denim and a blue workshirt, her hair cut in pre-Columbian bangs, her character, Beatriz, seems solid and sensible — a woman comfortably rooted to the earth. She doesn’t think of herself as judgmental. The film sets out to test that belief. Beatriz is a massage therapist and holistic healer in the LA area — she’s New Age-y without making a show of it — who works mostly with hospital patients but has a few private clients as well. Early in “Beatriz at Dinner,” she drives up into the Hollywood Hills for an afternoon session with Cathy (Connie Britton), the wife of a real estate developer. Cathy’s the kind of sincere, entitled rich woman who honestly believes she’s friends with Beatriz; the relationship shores up her progressive bona fides. Beatriz, placid and giving, rolls with it. The movie is about how, after a lifetime of rolling, this woman finds herself coming to a hard stop. With her car on the fritz and a tow long in coming, Beatriz is invited to Cathy’s evening dinner party, much to the chagrin of Cathy’s husband, Grant (David Warshofsky). The evening is to celebrate the closing of a major development deal along with two other couples, the young and avid Alex (Jay Duplass) and Shannon (Chloe Sevigny), and the older Doug (John Lithgow) and his trophy wife Jeana (Amy Landecker, who plays Duplass’s sister on TV’s “Transparent”). Doug is the star of the evening, a swaggering self-made real estate tycoon, and initially the amusements of “Beatriz at Dinner” lie in watching the younger men contort themselves into positions of abasement. 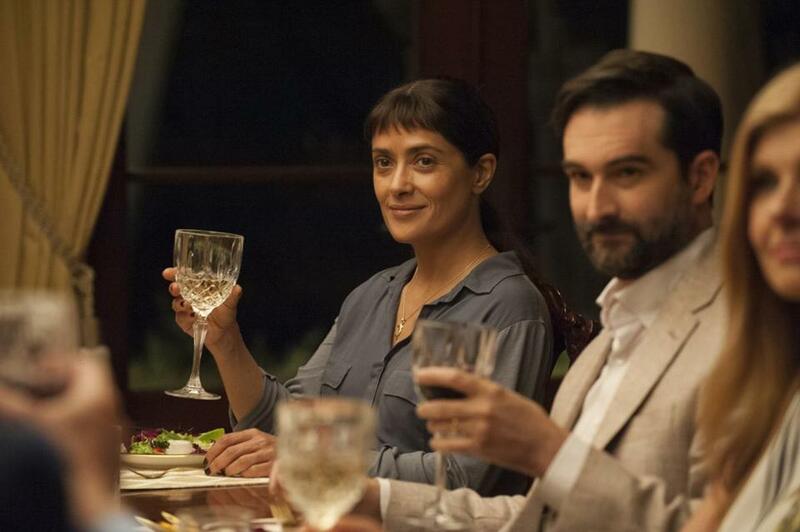 As the dinner progresses and Beatriz slowly comes to understand the extent of the very real damage this man has visited upon the world — her world — the movie becomes about choice. What is she going to do about it? What can she do about it? “Beatriz at Dinner” has been directed with subtle but damning chamber-comedy finesse by Miguel Arteta (“The Good Girl,” “Chuck & Buck”) and written by that great deadpan satirist Mike White (“Chuck & Buck,” “School of Rock,” TV’s “Freaks and Geeks”). The movie’s a fable for the age of Trump, obviously, but it gazes at an entire range of toxic titans; White has said the inspiration came from the news item about the Minnesota dentist who killed a beloved African lion on safari. The filmmakers pay sly attention to the evening’s social nuances, and there’s some rich observational comedy in the reactions of these 1 percenters to the stolid Beatriz at their table. The men especially are appalled and amused — she’s the help, isn’t she? — while the women are outwardly gracious and inwardly monitoring each and every social boundary crossing. If nothing else, “Beatriz at Dinner” is a field guide to the social behavior of the nouveau riche. Lithgow, in particular, rises to the occasion, and his Doug is nearly as charming as he is loathsome. You could say the movie is shooting fish in a barrel, but then you’d also have to admit that both fish and barrel are asking for it. Eventually the comedy leaches away and the title character — this kind, uncomplicated woman who sees the good in everyone — has to say something, do something, act. At one point, she gazes out at the audience, as if asking us, Well, what are you going to do about it? “Beatriz at Dinner” isn’t sure what the answer is, so it fantasizes about vengeance and seems to settle for despair. That’s a weakness of the film while also serving as an honest reflection of what many decent people feel about the world these days. In a mere 83 minutes, “Beatriz at Dinner” gets close to the heart of the matter. It has the length of a palate cleanser but the weight of a full meal. Directed by Miguel Arteta. Written by Mike White. Starring Salma Hayek, John Lithgow, Connie Britton. At Coolidge Corner, Kendall Square. 83 minutes. R (language and a scene of violence).